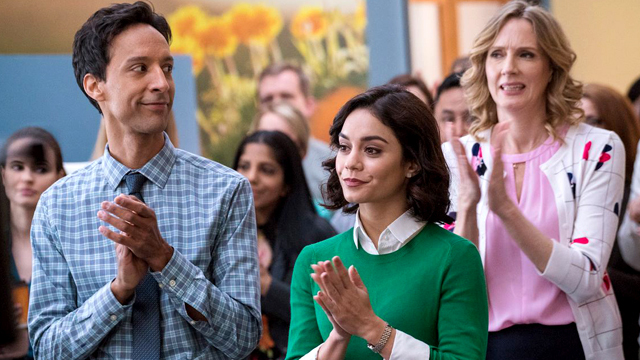 Welcome to Charm City, the fictional (but sorta based on Cleveland) home to NBC‘s new DC Comics comedy, Powerless. While the DCU is setting up its own continuity on the big screen and the rapidly-expanding Arrow-verse takes over The CW, Powerless offers a fresh take on a bigger-than-life comic book world. Officially designated by DC “Earth P,” the world of Powerless is one where the Justice League exists and prominently operates. Just don’t expect them to drop by Charm City anytime soon. 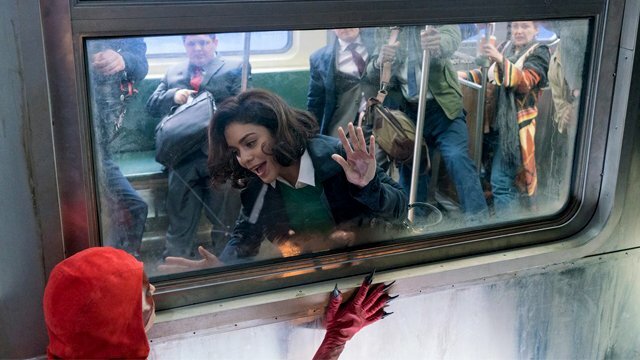 Check out more than 60 photos from the Powerless set in the gallery viewer below! Schumacker had been working on developing an earlier iteration of Powerless with former show runner Ben Queen. That version went so far as to screen its pilot episode at last year’s Comic-Con International in San Diego. Even though the initial pilot was extremely well-received, some major changes to the series occurred that resulted in the version premiering Thursday evening. The major change is in the characters’ workplace. Formerly set at an insurance firm (appropriately called Retcon Insurance), Powerless now takes place at Wayne Security. As such, Alan Tudyk, who always played the company’s dimwitted boss, was rewritten to be the cousin of Bruce Wayne. The new pilot also adds Ron Funches to mix as an I.T. guy named, coincidentally enough, Ron. The Earth-P version of Ron shares quite a bit with Funches, including his love of superheroes. Working alongside Ron is Teddy, a significantly more cynical developer played by Community‘s Danny Pudi. Pudi is no stranger to comic book universes, having made a cameo in Captain America: The Winter Soldier. While Teddy may come off as being very negative in the pilot, Pudi says that the character’s personal motivations will be revealed as season one progress. Christina Kirk’s Jackie, meanwhile, is the Wayne Security employee who has been unlucky enough to become Van’s personal assistant. For her, superheroes are just like celebrities and sharing conversations about them is one of the things that pulls the office together. 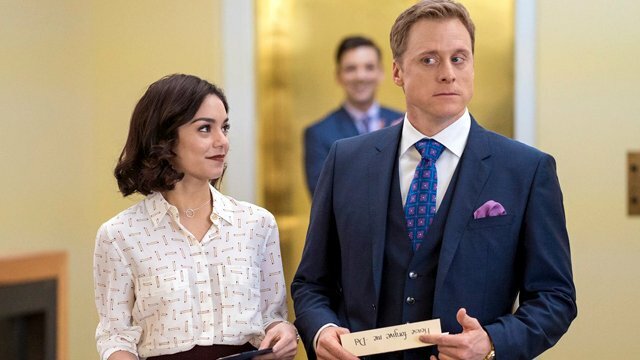 Powerless‘ central character, however, is none other than Vanessa Hudgens‘ Emily Locke who, as the series begins, has just moved to Charm City. One reason for shifting the action from an insurance agency was to keep Emily’s motivations pure. The writers quickly realized that the professional base case scenario for insurance adjusters is that they take money away from someone. Plus, dealing in security means a lot of fun inventions and makes for a more hands-on approach to the DCU. Among the episodes in the first season are plots that see Emily unwittingly dating a supervillain henchman and an ongoing plotline involving resident superhero Crimson Fox, who made her first comic book appearance in 1989’s Justice League Europe #23. 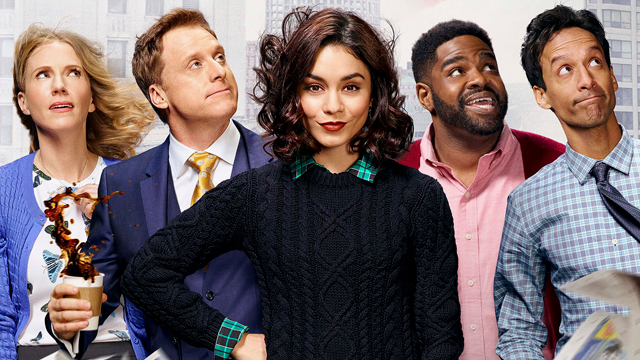 While Powerless should offer more than enough to keep comic book fans happy, the show is at heart a workplace comedy and one that its creators hope will find an audience for its non-superhero comedy ensemble. 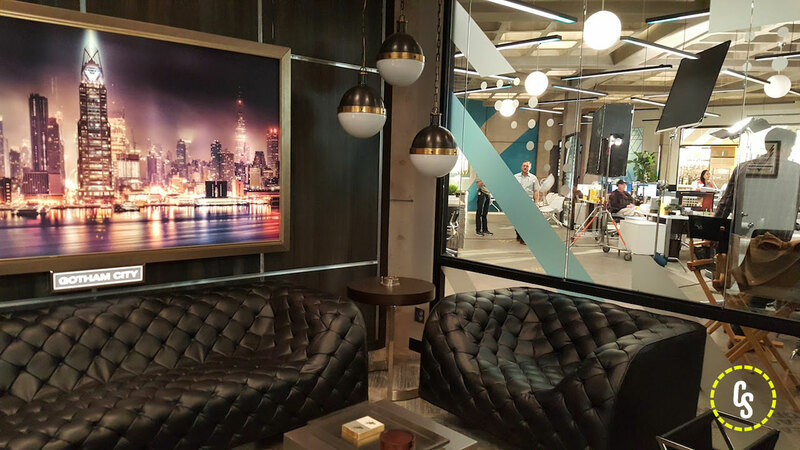 You can browse photos from the Powerless set using the gallery viewer below and catch the pilot episode Thursday, February 2 on NBC!